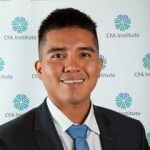 Miguel Ayala puts an economic lens over mega sporting events and examines the costs and benefits for host countries committing to significant investments in these long-term projects. This year has seen the Winter Olympics held in South Korea, the FIFA World Cup in Russia and, domestically in Australia, the Commonwealth Games on the Gold Coast. These mega sporting events have attracted millions of spectators, putting these countries and cities at the centre of the world stage. A feeling of nationalism in the citizens of the host countries, and cities may have found these sporting events pleasing, as the world observes the best of the host nation. However, this may not be the case anymore as countries and cities find it difficult to justify to the taxpayer the economic benefits these sporting events can contribute. Therefore, what is the rationale for hosting these mega sporting events? What motivates countries to engage in significant long-term projects such as the World Cup, the Olympics and many other mega sporting events? Hosting these sporting events involves a large financial cost for the host country. 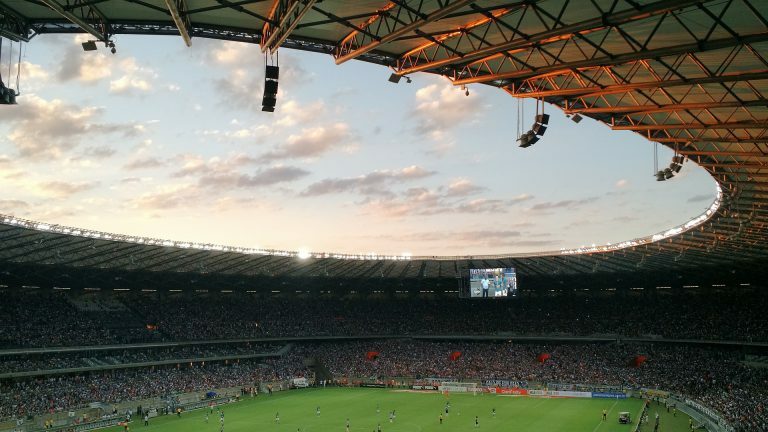 For instance, the 2014 FIFA World Cup in Brazil reached US$15 billion including cost overruns of at least 75%. Additionally, the average cost of Olympic games held over the last decade is US$8.9 billion, according to a research paper which found that the Olympics is one of the costliest and financially riskiest types of mega sporting event that exists. This debate has been relevant over the years since there is no clear consensus on whether these events produce an economic benefit or not. Empirical studies that aimed to assess the economic contribution of sport show mixed but mostly negative results caused by public investment into sport events, infrastructure and sport franchises. The economic contribution of sport in general is very challenging to estimate. There is a lack of data with which to measure direct and indirect economic benefits. For instance, sport related activities have a positive relationship with physical and mental health, but these positive health effects tend to be lagged over time so most economic models fail to capture this behaviour. Additionally, most studies that attempt to estimate these factors state that data has been the main constraint for good assessment. Even though there is a recognition of difficulty in the estimation of these benefits, they agree on the existence of these economic benefits due to sport-related activities. On the other hand, most of the economic stimulus that mega sporting events produce crowd-out the existing local demand in the host cities, such as inflating prices for food and accommodation due to an influx of tourists. This produces a neutral change in the economic benefits. What is the reason for government involvement at the state and national level to spend taxpayer money on hosting more mega sporting events? The answer to this question has evolved over the years in most developed countries from a public policy objective to a marketing strategy to attract more people to cities to boost the tourism sector. In Australia for instance, the New South Wales government faced pressure to justify the rebuild and refurbishment of two stadiums at a cost of AU$1.5 billion. The New South Wales government’s justification is to ‘realise the economic and social benefits of (a) strong cultural and sporting sector, and support liveability for the people of NSW’. However, a cost-benefit analysis undertaken by Infrastructure NSW showed that the benefit cost ratio of the projects is less than one. This means that the economic costs are greater than the economic benefits. Physical activity participation levels in countries such as Australia have increased over time but this has shifted away from sport clubs and towards fitness centres, making sporting events more for mass entertainment purposes and less for health activities. Investing in these types of projects has also questioned the way taxpayer money is being used as resources are constrained. A lack of relevant data is still an obstacle that is necessary to overcome in order to provide a good economic assessment of sport. Flyvbjerg, B., Stewart, A., & Budzier, A. (2016, July). The Oxford Olympics Study 2016: Cost and Cost Overrun at the Games. SAID Business School. Baade, R. (1994) Stadiums, professional sports, and economic development: assessing the reality. Heartland Institute Policy Study. Gratton, C. & Taylor, P. (2001) Economics of sports and recreation. Spon Press, London. Infrastructure NSW. (2018). 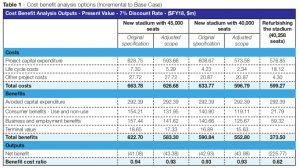 Business Case Summary, Sydney Football Stadium Redevelopment. Sydney: Infrastructure NSW. Subsidising mega-sports events: good or bad call? 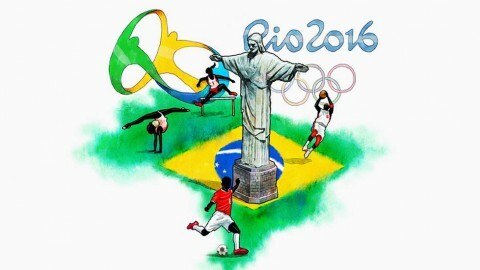 Hosting the Olympics – a winning strategy?